Formerly known as Flora Vegetal Silica! Vegesil is the new name for the premium Vegetal Silica which is prepared using a unique aqueous extraction method developed and patented by Dr. Louis Kervran. This method ensures the vegetal silca is bonded or "chelated" to a group of water-soluble bioflavonoids. It didn`t happen overnight. In fact, it has probably taken years for the signs to become annoyingly visible. Chipped, dull nails. Thin, listless hair that won`t grow long. Wrinkles that have appeared much too early for your stage in life. It`s easy to attribute these problems, plus the invisible deterioration of bones and connective tissue to aging, and to decide to simply live with the inconvenience. In reality the problem could well be a lack of silicon, which is easily corrected. Why is it difficult for the body to maintain adequate levels of silicon? Silica, from which the body produces silicon, is not especially common in foods, unless they are grown in sandy soil. Even then it tends to accumulate in plant parts, like husks, that we don`t consume. When silica is present, it isn`t always in a form that is easy for the body to absorb. Silica from (from horsetail extracts, aerial parts), Microcrystalline cellulose, hydroxypropyl methylcellulose, corn syrup solids, magnesium stearate. 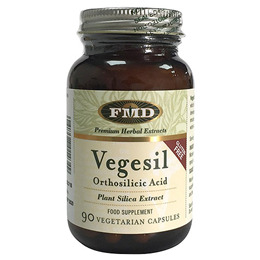 Below are reviews of FMD Vegesil - Plant Silica Extract - 90 Capsules by bodykind customers. If you have tried this product we'd love to hear what you think so please leave a review.